Kolkata and suburbs take immense pride in her food culture, a blend of authentic Bengal, age old rituals, the heady hangover of colonial cocktail and essentially Nawabs. 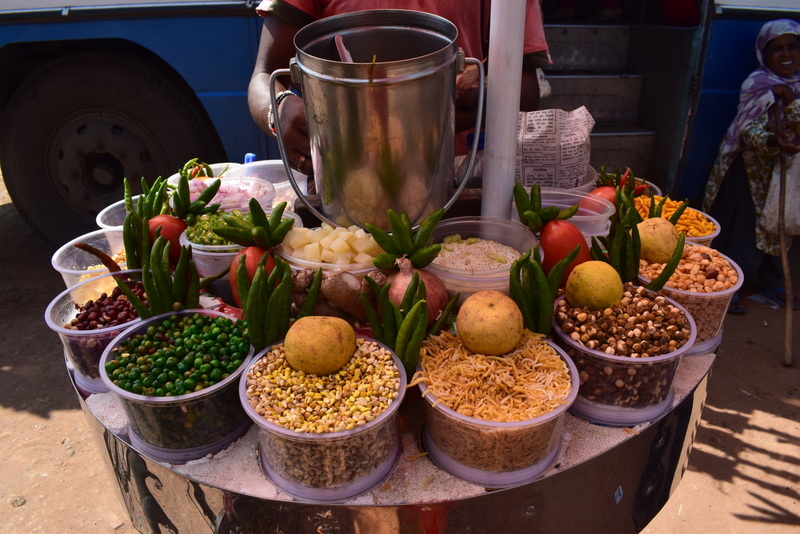 Of course there are Maach (fish), Mishti and More, but I am here to talk about the cheap eats of Bengal, which shall cost you somewhere around INR ten(yes, you heard me right, 1/7th of a dollar!). 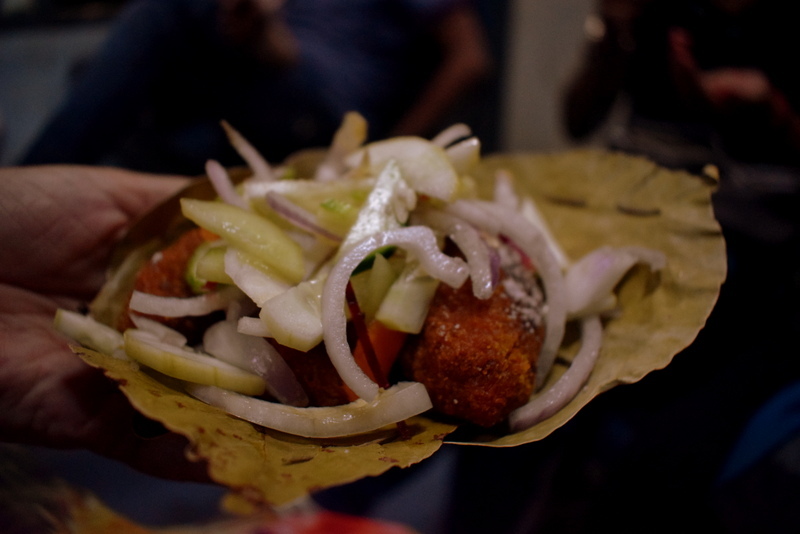 ARe you ready for the ultimate Kolkata Street Food Tour? 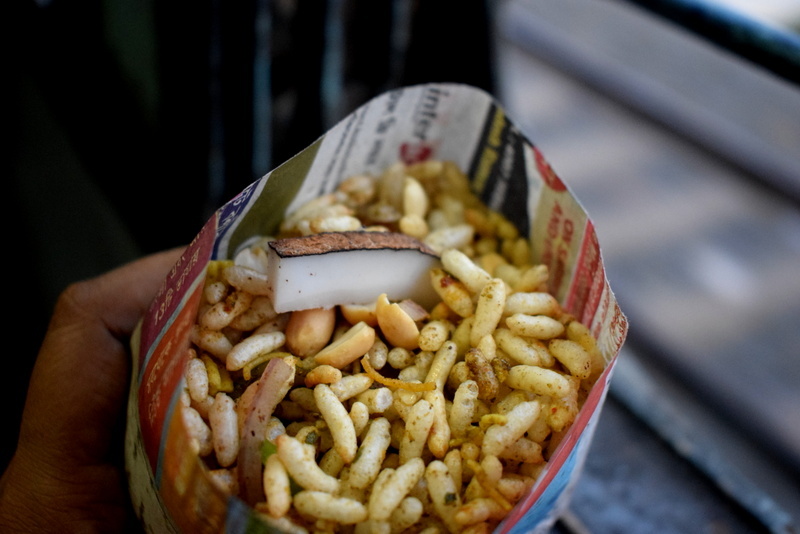 Jhalmuri is a wonder mixture, marrying puffed rice with a blend of spices, boiled potatoes and often topped with a crescent coconut slice, presented in a handmade Thonga (an easy take-way carrier, made with recycled paper). A lot of cries were going on suggesting they stop using newspaper to make the Thonga, for the ink is injurious to health. However, Indian subcontinent dwellers are particularly strong in immune system. Hence, a gentle serving of Jhalmuri sate us and not sicken. Nevermind, the Thonga making is a huge source of income for many under privileged families. 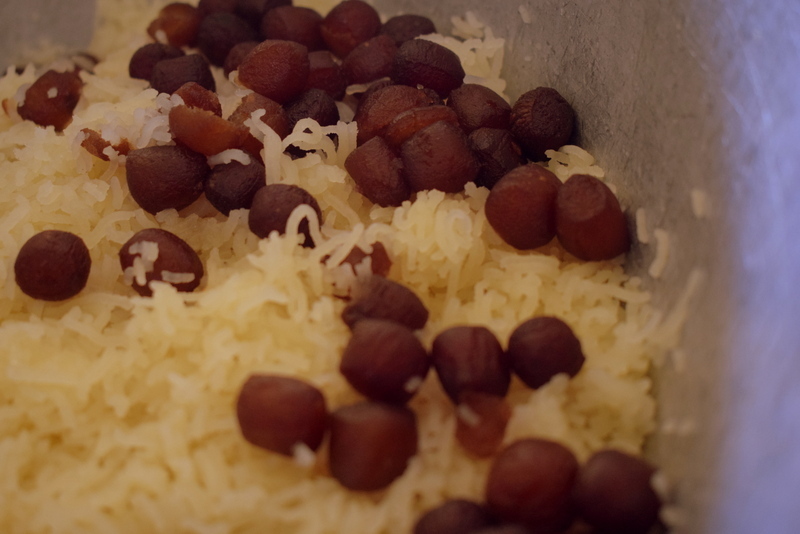 My initial days of traveling in the great Indian Railways inevitably came with a handful of Jhalmuri. Baba would get me a pack for INR 3 (circa 1994, if I remember correctly) and keep me engrossed in it, away from the other worldly pleasures (read, the hawkers selling plastic dolls). I would save the coconut slice for the last bite. “You should eat the best thing at the end“, I have been taught. 3 decades down the line, I try to save the crescent coconut slice till the last bite. However, by day the slice is getting petite. Three decades down the line, we are still eating Jhalmuri for a meager ten rupees, ignoring massive inflation and economic upheaval. 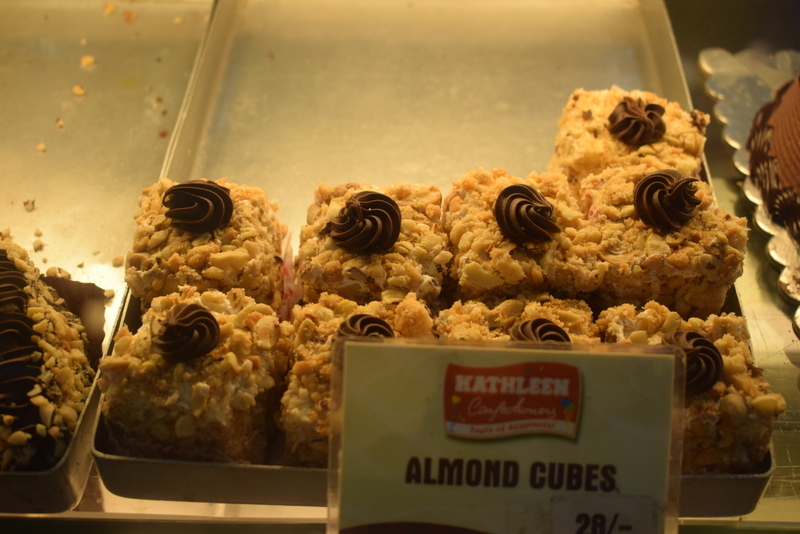 Earlier, I could also treat myself with a handful of Cheenebadam, roasted peanuts. They are scarce these days. 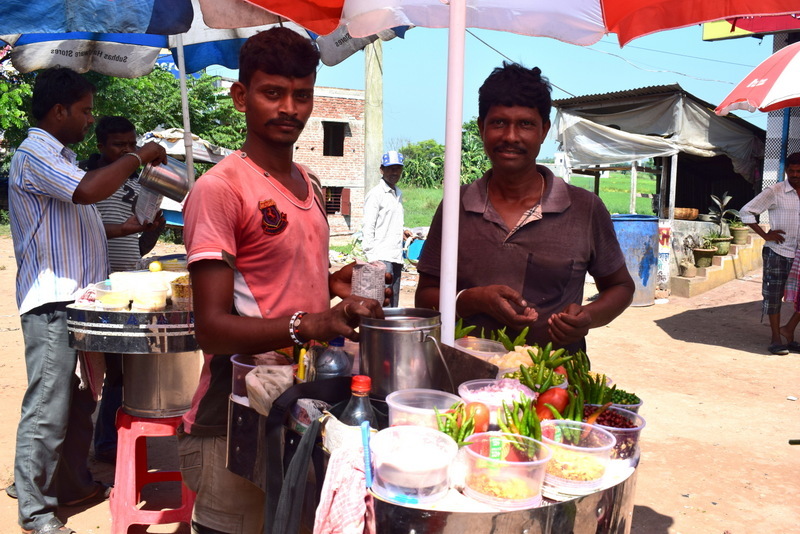 Find him the next time you visit Shaktigarh! Pro tip: please enjoy Jhalmuri during train travel or the longer bus journeys. The regular Jhalmuris, sources from the old streets of the city, lacklusters in the make in my opinion. 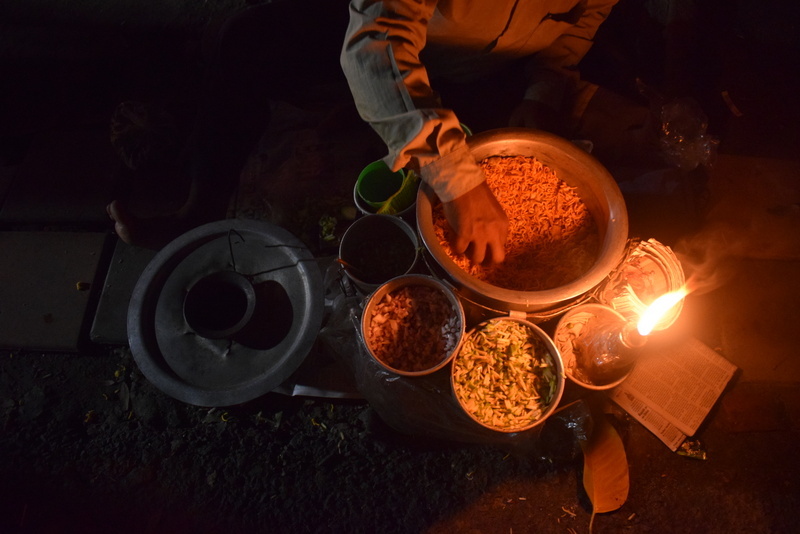 The Kolkata parks that shelters couple in search of cuddle and warmth, provides a cheap treat for their soul, Ghotigorom, a very close competitor to Jhalmuri is served from an earthen pot, kept gently warm with a kerosene flame. Their “thonga” is not even handmade. It is a piece of paper, twisted and given a triangle shape. Ghotigorom is a mix of Daalmut, a gram flour made tiny lot of sticks and freshly cut onions and cucumber. Well, you may debate with me with the freshness of onions though! In past 5 years, I have seen the price whopping from 5 to 10 for a packet of Ghotigorom. It even soars high up to 40 rs during Durgapuja. The burn! That’s about half a dollar. Pro tip: grab your “thonga”of Ghotigorom while strolling by the city’s own Hoogly river. Sans the sweetheart, the Ghotigorom is deem fit to keep you warm. The legacy of the song “Ami Kolkata er rosogolla” goes way beyond what mind can perceive. From indecent lure to adorable nicknames, your Bengali identity will call for the invariable song being sung at you, for you, while you are around, used as catcall, for dance request and what not. Thou shall not be disheartened though. 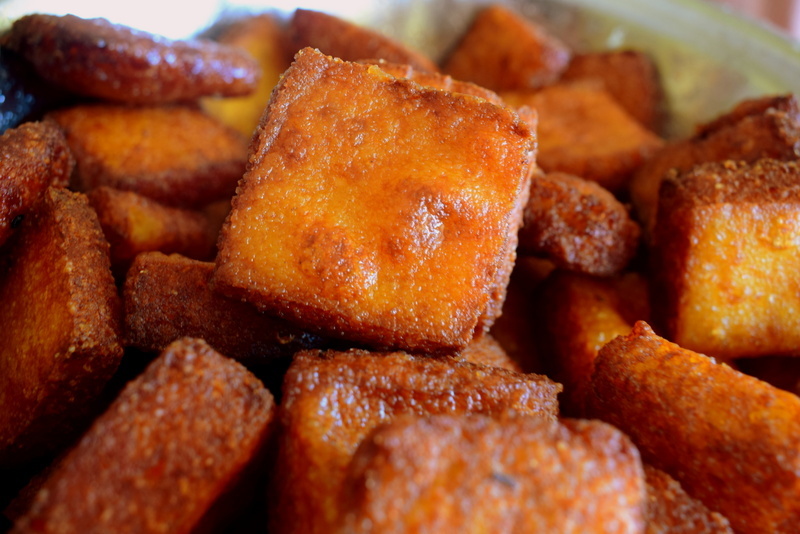 Though shall savor few more while sponge like cottage cheese delicacies in typical Kolkata style, “top kore”. Thou shall be careful about the sugar syrup and mean to avoid for shooting blood pressure and diabetics count. However, at the end, you will know, it don’t matter. You will eat one more. Yes! 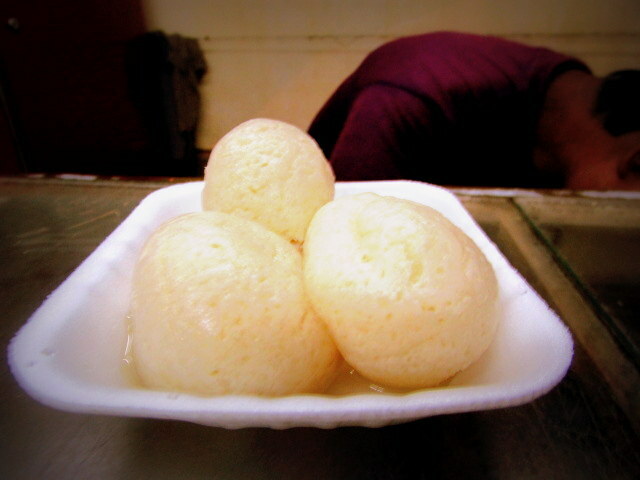 Rosogolla! 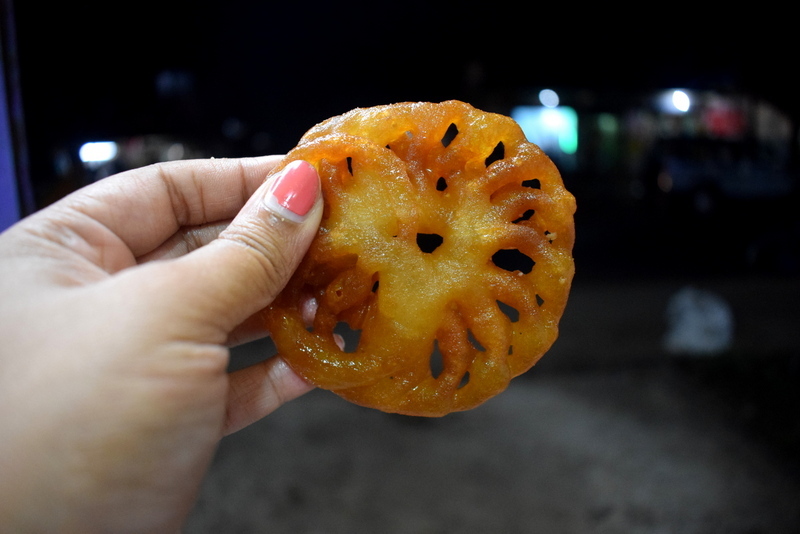 a Kolkata Street Food Tour is incomplete without the gentle supple taste of this Cottage Cheese sweet! Pro tip how to eat one! Dadu would never say no to anything I ever demanded! Except for cold drinks. And Magi. “Ki Khao egulan?” He would ask often. It was one of the balmy Kolkata afternoon he introduced me to Ramu. Ramu was a student from my dida’s school, a 12 YO kid who would run at the first chance he would get from the studies. Summer vacations had had Ramu and me sitting together and taking English grammar class from dadu, for a couple of hours before we could go play. During one of the play activity I witnessed Ramu climbing the coconut tree at dadu’s courtyard like a rodent. A lot of requests followed after which Ramu did try to push me through the trunk till I fell to break one milk teeth. I was 5 back then. The teeth would have went off by itself, anyway but the fall made us culprit. 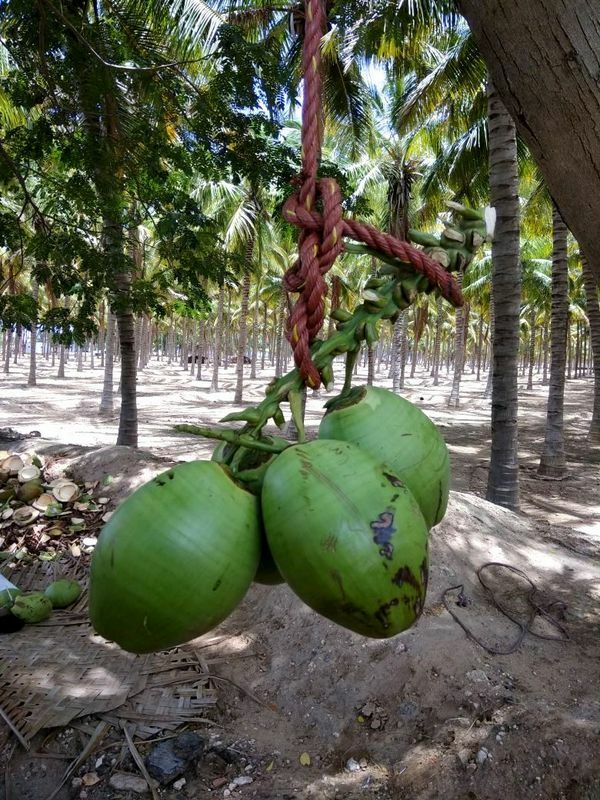 Ramu would bring me the fresh green coconuts straight from the sky as and when I wished for! These days, you find them at every corner of the street. 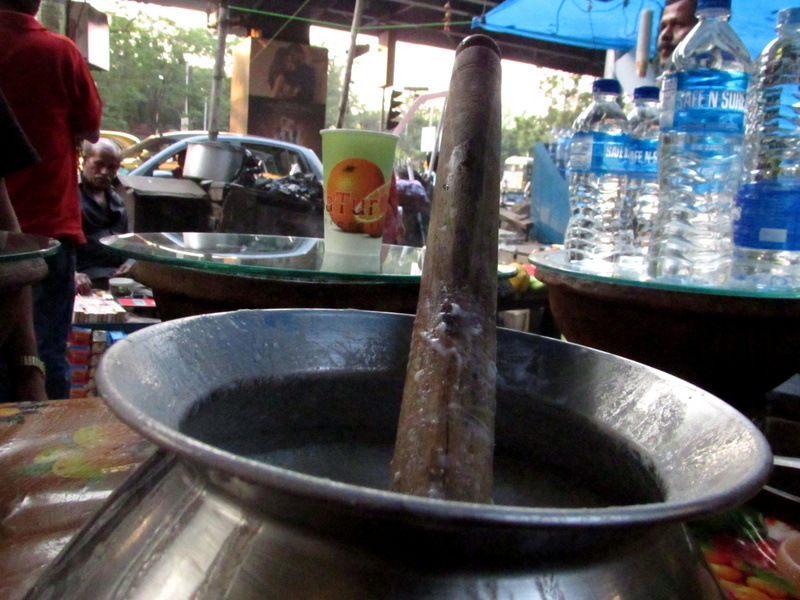 While walking on a food tour in Kolkata, you quench your thirst with this and no soft drink. Typically! Pro tip: Use them as the anti-blemish toner. Use the malai inside to cook with prawns! 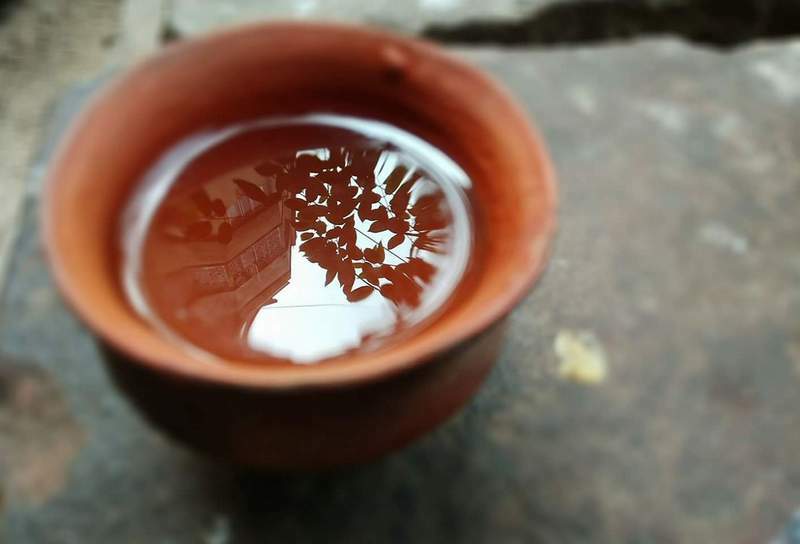 A cup of tea, fragrant with the freshness from tea valley’s of Darjeeling, await you at every corner of the street.The fresh brew is sweetened with sugar and made more appealing with milk. What makes it unique is the “Matir Bhar” or the earthen pot they serve it in! Pro tip: Do break the earthen pot after are finished drinking. There is a parallel business ongoing where children will hunt for the used pots and resell them for another drink. 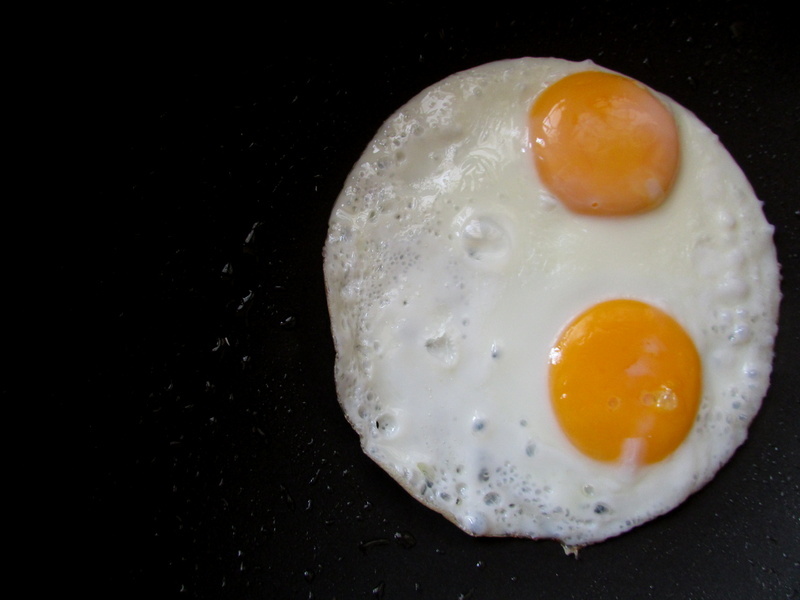 Eggs are survival essential in the sultry humid city. Whether you are traveling in train or packing up for a picnic or ordering the heavily Indianised Chinese noodles, you would prefer a piece of egg in it. For the blessed soul, an early morning visit to a local market may result in handpicked duck eggs, with yolks being creamier, tastier and a fiery red. Pro-tip: Do try the green chilies with egg and not just red chili power. The intense aroma of green chili is a winner with a sober boiled egg. If you want to shy away from experiments, go with my mother’s choice, the boiled egg with salt and pepper. The pepper works only if it is freshly crushed. 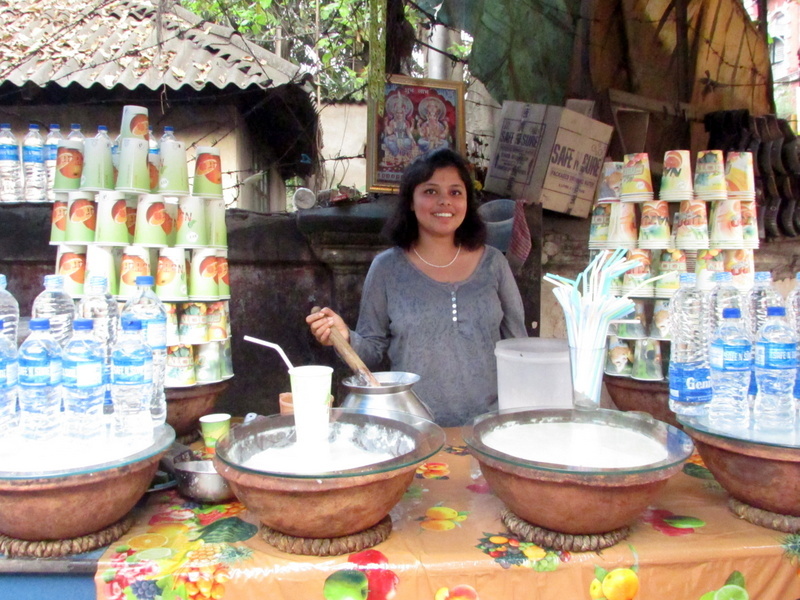 While the whirlpool of a pot separates the whey from curd effectively and provides the much needed solace for weary souls as the summer advents, Kolkata gets inspired by mainland Punjab and brings the goodness of Lassi on her streets. 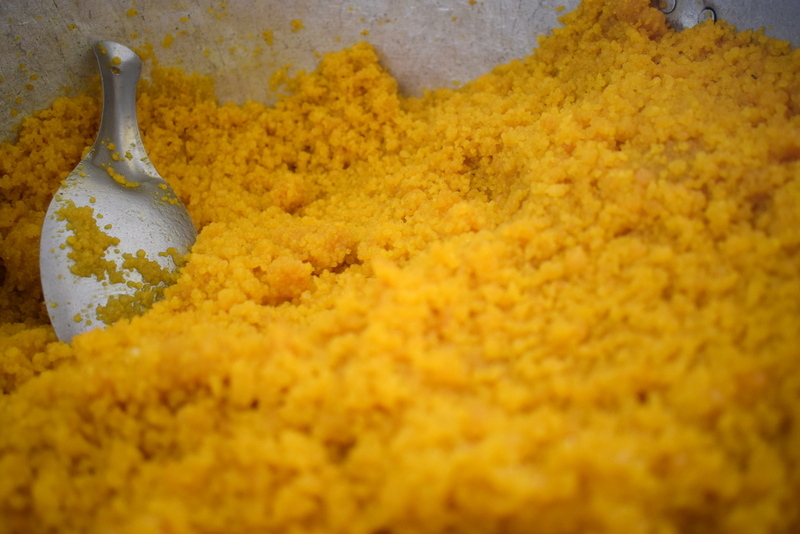 often flavored with fresh pulpy Mango, it has evolved to be a charming nectar and replaced the more traditional Beler sorbot or Aampora for our loss. Chop, I wonder, how has been christened so! 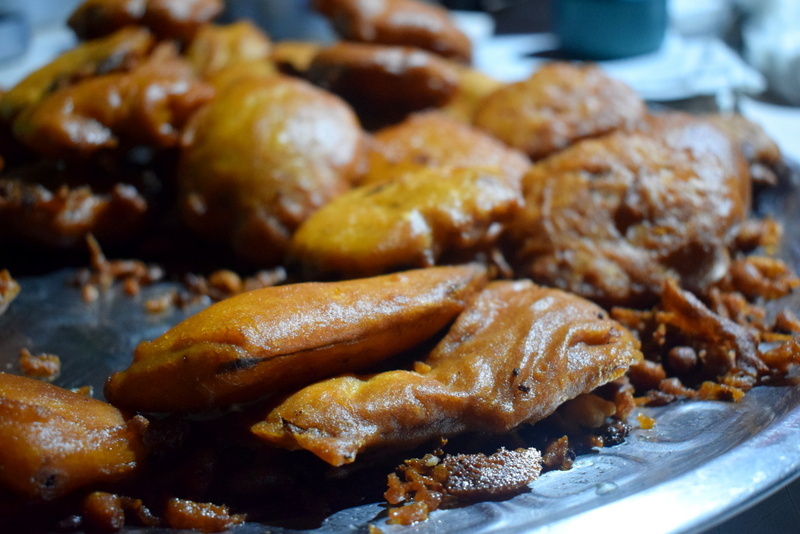 It is a melange of vegetable, or just potato, sometimes the aubergine, battered with gram flour and deep fried. Many attribute the batter fry trait to be a direct influence of British era. The lackluster industrial scene of the state of West Bengal, with sarcasm, is often referred to as “Chop Shilpo” denoting nothingness. Keeping politics aside, I suggest, try to grab a hold of Dim er Devil, the Kolkata’s answer to Scotch egg. My initial days at kitchen had been all about learning to make the perfect potato feel for Dim er Devil! Pro tip: Try the Beguni. My all time favourite. Do rub the Chop with the piece of newspaper they serve it on to remove excess oil. We only can save our heart! During my college days, Kochuri had been a savour. The kochuri of North Kolkata lanes, where they fry the bread in front of you and serve the hot product on top of Motor Daal. It is so good! Let me try to explain how the wonderful bread is prepared, Once you have kneaded the flour dough, you make small portions of it, stuff it with cooked grounded green peas and spices, flatten it to a round shape (for the beginner the round may take the shape of our country, but that’s okay) and leave them in Karai to deep fry for a few minutes. 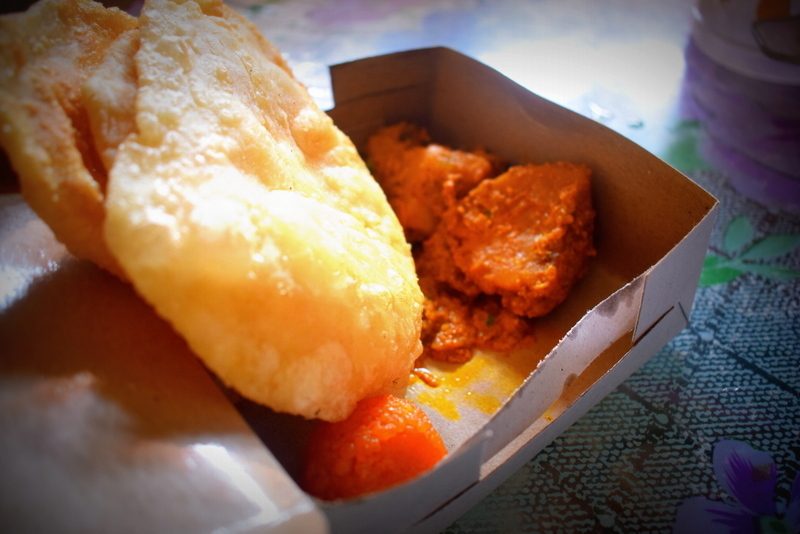 It is the quintessential breakfast element of North Kolkata! This was my favorite last resort in the city. It still remains! 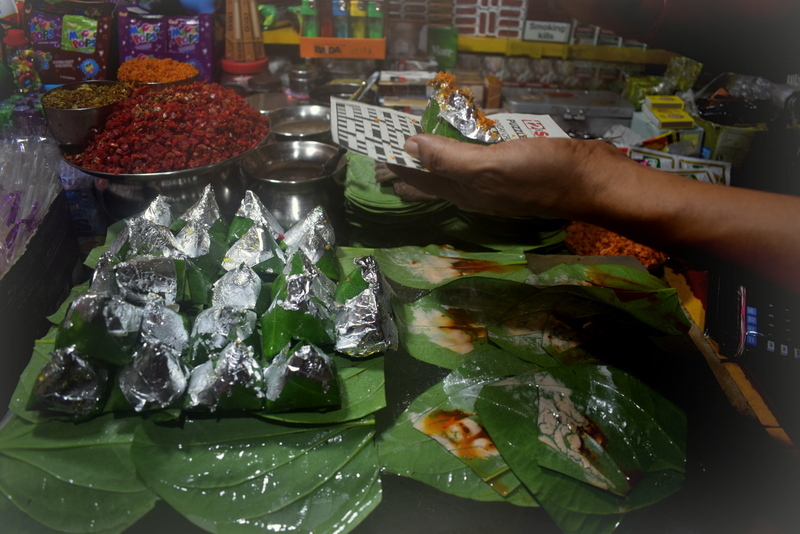 Imitating the benarasi Paan, the Paan they sale at the streets of the city are quite exotic. Of course you may try to take a leap of faith with a Jarda flavored paan, that will give you a good “Kick”. 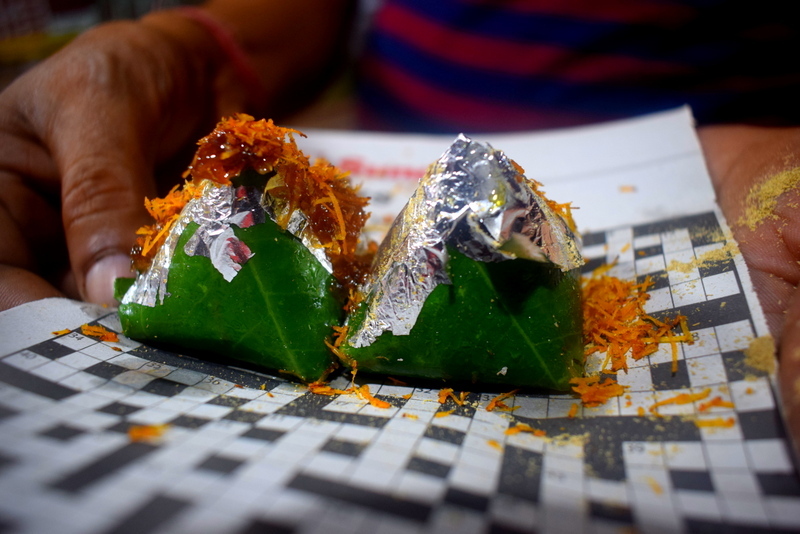 I love the Mishti Paan variety, where the beetle leaves are stuffed with rolypoly jimjams inside! Chew them well, do not spit on the wall!!!! Pro tip: For souvenir shopping in Kolkata, you may want to look for a “Paaner Baata”, the traditional beetle nut case the Bengali Ladies has been using for ages. Monginis, later rechristened as Mio Amore and Kathlyn were the introductory places to the world cuisine for many of us. They gave the first lesson what a patties, a spring roll, a cutlet and almond pastry may look like before we ventured into the “Sahebpara” of Parkstreet and overtly colonial Flurys. These days, with every visit, the limitation becomes remarkable. However the taste of the cream-roll and related elation remain the same, just the price took a threefold leap.Never mind! I love this Cream roll! But try to eat one early morning, they get soggy by the end of the day. Not like the Rosogolla but our casteist society has bestowed sheer admiration for Amritti or Jilipi, otherwise known as jalebi pan-India. Each bite to he crunchy super coated spiral wave, each step forward to the other world, a new dimension! Amritti! the big brother of Jilipi. Pro tip: Try at the end of your food escapade for extreme sweetness can cause loss of appetite for a long period of time. 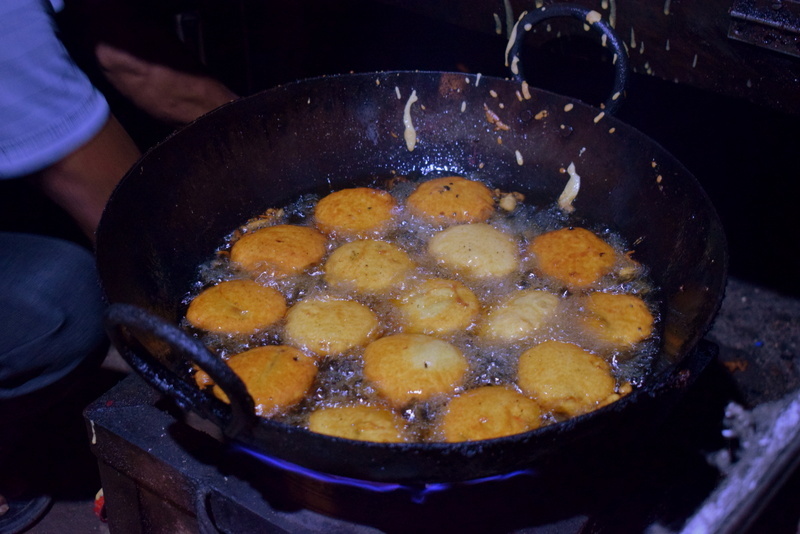 Imagine the creamy layer of the boiled milk getting saved up for a fried delicacy! That is Chanapora. In many ways it tastes like cottage cheese deep fried and sweetened. Not the best of Sweetmeats of Bengal however one of my favorites. This big a tub! 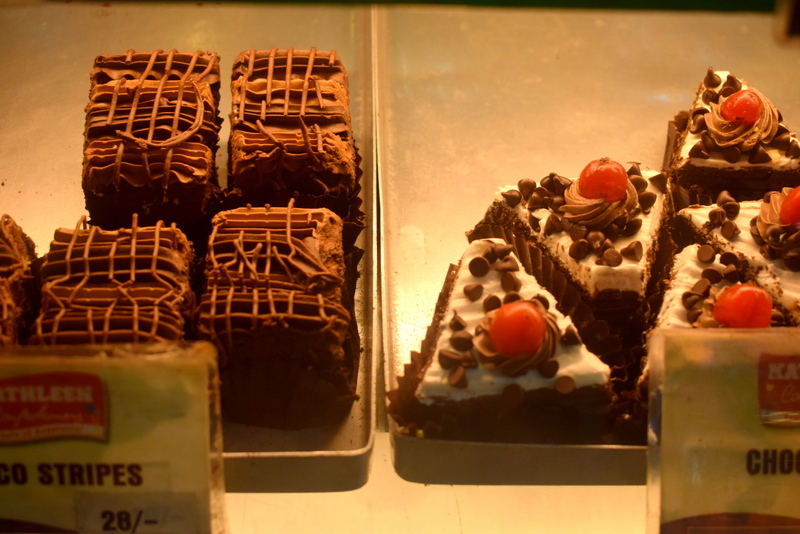 If you are lucky you shal find them in Kolkata. The most famous ones are produced in Shaktigarh. Honorary mention: The rolls. If you have noticed, none of the aforesaid options contain fish or meat. That should not indicate we do not have cheap eats rich in protein! A decade back, a chicken roll would have cost you 15 bucks which is the exact double now. However, trust the yum sheek-kebabs of Prince Anwar Shah road. The beef rolls from the street has always been a favorite among the student populace. Thankfully, unlike the north Indian states, beef is celebrated as a delicacy (read Oly pub, the erstwhile Olympia) and not hunt down for lynching (yes, the cow terror of North India). 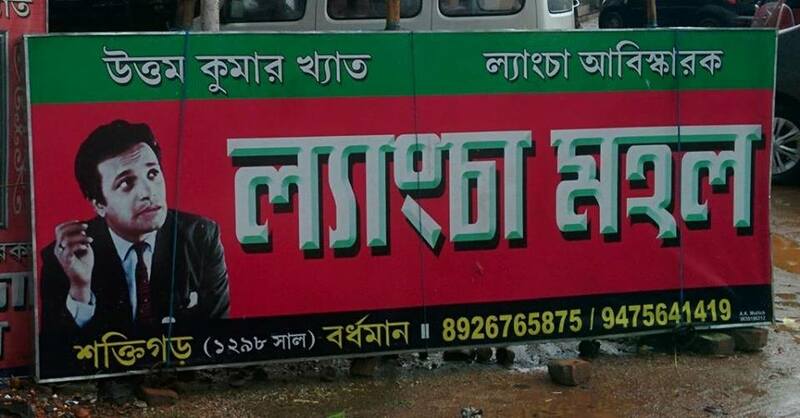 A quirky advertisement on Lyangcha from Shaktigarh, featuring the great filmstar Uttam Kumar! Sourced from Bong Pen. Do look up his site if you can read Bengali. A great find! And you? 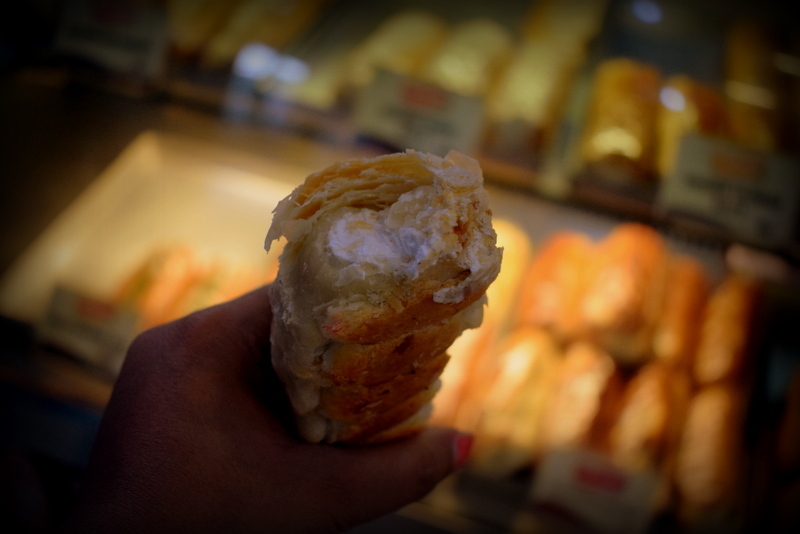 What has been the one favorite food you have always loved in your city? Thanks for the warning…I would totally eat way too much Chanapora if I were in Kolkata and end up sick. It looks SO delicious. Haha.. Chanapora is what I love too! even more than Rosogolla. Such a lovely post! I should have been asleep for more than two hours by now but instead started reading. I was already a bit hungry (skipped dinner as my flight got delayed and I ran for my train instead etc) and really feel like trying out the food you described. As I am from a small village in the Netherlands I am afraid I don’t have anything exotic to suggest here in my comment. One of my best food experience remains the delicious food we had in Cambodia at several food stalls. We both also truly love Japan for its delicious and very pure food. 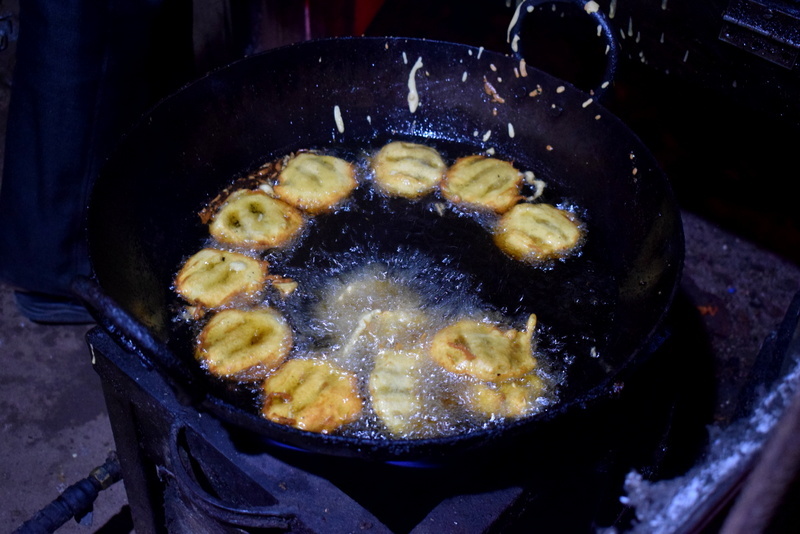 Traveling is all about trying out the local food, I enjoyed reading your post! This post left my mouth watering! I’d love to try all of the flavors and spices of Bengali food one day, everything looks so delicious and so different from what I’m used to! Enjoyed reading this post ! All these goodies look delicious & tempting !! Let me see whether I can make it! ? It’s good to learn different kinds of food from other places that I haven’t heard of before. But I’m not sure if I can eat too much spice. ? Umm. if spice is the concern, I suggest stick with the good old sweets of Bengal! They are made of milk and not spiced up. I just landed in India two days ago and I am saving this post to make sure that I eat everything!!!! I love how you were able to include so much food – I often times forget what i have eaten and everything, but you managed to put together a great list! I will let you know how it goes, trying to eat it all!!! It all seems so strange! I would love to try most of these things. I dont think I will be visiting India soon but if I ever do, now I have a list of things to try! Thank you very much for sharing and inspiring! Alot of these foods are so unfamiliar to me but they look so lush. Do you have any recommendations of where I could try such foods in London? I’ve tried most of these food items the last I was in that place! Looks like I have to go back to try the rest! Looks so yummy and delicious! A lot of food to try! They all look so good and tasty. I have lived in Singapore for a few years and despite the general Indian culture, I don’t see a lot of these foods there. 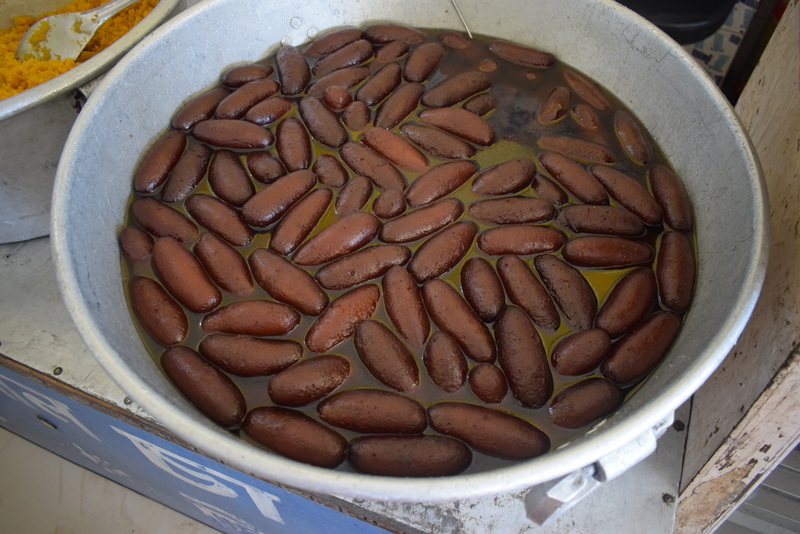 I think I’ve tried Jilipi but didn’t know it was called that name until this post. Haha! Thanks for sharing! Haha. 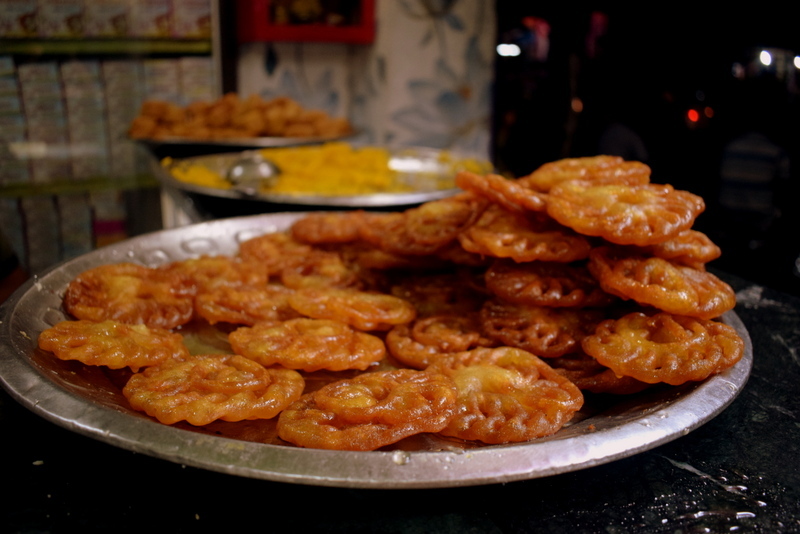 The regular name of Jilipi in India is jalebi (the Hindi word) also they are very specific to West Bengal, Kolkata and surrounding region. Different states here have different street food on offer. Wow I’ve never heard of or seen the majority of these foods. I love that a lot of them are vegan friendly. A lot of it seems deep fried though which is a bit too unhealthy for me… I’d love to try the Jhalmuri though. You really know your Indian foods!